Hi folks, Doc here. One of the greatest icons in all of Gilbert Erector history is the Parachute Jump model. This large and imposing yet wonderfully elegant design made its first appearance in Erector manuals in 1940. It was patterned after the famous Parachute Jump amusement ride that thrilled visitors to the 1939 World's Fair in New York. The idea for the World's Fair parachute jump began in the 1920s in Russia, where simple wooden towers were used to train the world's first paratroopers. 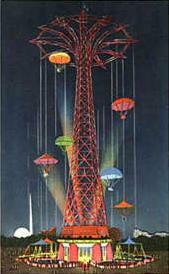 These towers also proved to be popular recreation for Russian citizens. In the early 1930s, retired U.S. Naval Air Commander James H. Strong witnessed these towers in operation in Russia, and set out to design an improved version for use by U.S. military trainees. Strong patented his original design in August of 1936. 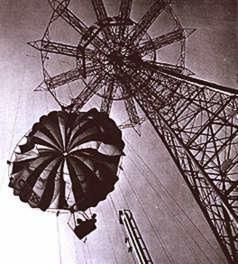 It utilized electric motors to pull the 24' diameter military parachutes up a series of eight steel guide cables that were arranged in a circle around a tall steel tower1. 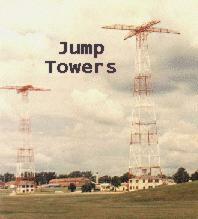 Over the years, Strong sold military jump towers to branches of both U.S. and foreign armed forces; three of his towers are still in use at Fort Benning, Georgia, to this day2. Several versions of Strong's original jump tower design were erected on his private estate in New Jersey in 1936-37, where they aroused a great deal of interest in the local residents, who often requested rides. In response, he created a "public" version of the jump that featured a redesigned mechanism to soften landings, and increased parachute size (32' diameter. In 1937, with the interest in his "public" jump tower running strong, his company converted an existing 200-foot tall observation tower in Chicago into a six-chute amusement jump ride. The ride was operated successfully for a year, after which Strong sought a concession at the upcoming 1939 World's Fair for a taller (250') and more elegant jump that eventually supported 12 parachutes. The popular ride was sponsored by the Life Savers Candy Company, which decorated the tower with large, brightly lit "candy" rings. 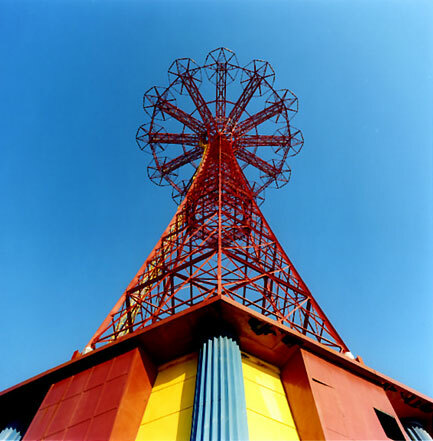 After the World's Fair closed in the Fall of 1940, the Parachute Jump was purchased and continued to operate in Coney Island's Steeplechase Park until the Park closed in 1964; operation of the Jump ceased for good in 19681. Thereafter, it stood idle and rusting in the Atlantic Ocean salt air while alternately being scheduled for demolition and/or sale. Declared a New York City landmark in 1988, the Parachute Jump was protected until restoration began in 1992. Today the Jump stands newly repainted in its original colors and structurally sound again, although it remains sadly idle and unused. Two versions of the Erector Parachute Jump model have appeared through the years. The original 1940-48 design, as previously mentioned, was patterned after the World's Fair Jump, as the images below will attest. In 1949, Gilbert redesigned the Jump model, increasing its height, improving the lifting mechanism, and changing the shape of the top section of the tower (see below). Since then, creative Erector enthusiasts have further refined and improved on the Jump model, creating designs that are taller, support additional chutes, and incorporate other innovations. Today, the Erector Parachute Jump remains a favorite model of Erector fans, and a classic example of an excellent design based on a real-world example. This entire work, unless otherwise noted, is © Prismatrix LLC. All rights reserved. Any reproduction or other use of any of its contents is prohibited without the written permission of the author and Prismatrix LLC.